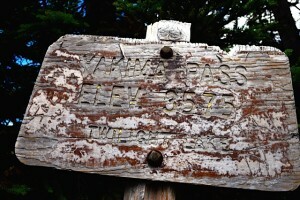 Yakima Pass has become one of my favorite historical hikes. 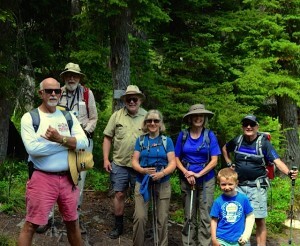 The first part is delightful–to Cottonwood Lake and Mirror Lake and then south on the Pacific Crest Trail to Yakima Pass. It is rich in Native American and railroad exploration history, narrated by George McClellan’s journals. In late July, on a sunny day, you’ll find bear grass, columbine, glacier lily, trillium, lupine, blue skies, and sparkling lakes. Frogs claim rocks in the creek that cascades down from Mirror Lake. 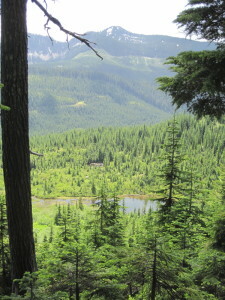 Even as trees grow again in the clearcut areas, the lay of the land and the pass visible from the lakes remain the same. You’ll know you’ve reached the pass by the feel of the land and the weathered sign that marks it. If you don’t want to climb back up to Mirror Lake, on the PCT, there is a short-cut back to Road 5480 (and your parked car) on two gullied old logging roads, which are easy enough to follow, but be forewarned that the footing can be tricky–rocky, slippery and overgrown. When I first used this loop I could catch a glimpse of my car from this route, but now vegetation has grown obscuring that view–but not the lovely view of Lost Lake. 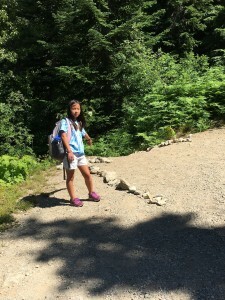 Lila Becker points to the Mirror Lake trailhead. 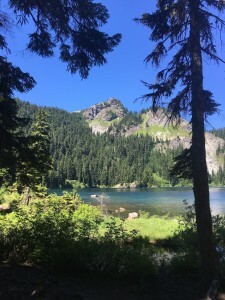 The hike has not changed greatly since I recounted it in Hiking Washington’s History, but here are a few clarifications: when driving to the trailhead, at the unmarked four-way intersection, veer right along the north side of Lost Lake (don’t take the sharp right). The last half-mile up to the trailhead is completely un-drivable, and parking spots on Road 5480 can be competitive on the weekend. Although a sign points uphill to the Mirror Lake trailhead, the beginning of the trail itself is not marked by a sign but by a cairn or row of rocks, thoughtfully placed.